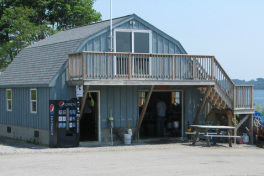 Lobster Shop - Erica's Seafood, Inc.
At Erica's Seafood we strive to offer our customers the freshest Maine lobsters available. All of our lobsters that are sold for retail have been hand selected by Tom, himself, to ensure they are of the highest quality. We can provide you with as few or as many lobsters as you need. We also steam lobsters for you to EAT ON PREMISES or pack them for traveling with seaweed and ice. (Sorry, no shipping). If you need earlier or later pickup times, appointments can be made. We want our customers to have their very best lobster experiences with us. Not only are our retail lobsters hand picked but they are also kept in saltwater that is circulated straight from Casco Bay. We believe that is the reason our lobsters taste so good. During the summer there will often be lobsters that have recently shed their old shells in the tank. The new shells are extremely soft and take time to harden up. We save the old shells to show our customers how lobsters shed and how much they have grown. Many times you can find other local sea creatures; such as; hermit crabs, rock crabs, sea cucumbers and fish spending a couple of days visiting the tank. We want to give you, our customers, an unforgettable and educational experience.